4 June 2006 (The Hindu) – A feature story on the archaeology of the Bujang Valley in Malaysia and connections with the South Indian Pallava dynasty. On a trip to Malaysia, we drove into the green Bujang Valley in Kedah, the oldest State in Malaysia. And we learnt that it is recognised as the oldest State because foreign sailors set up an ancient trading settlement there in the Fifth Century A.D. These “foreign sailors” were Tamils, subjects of the Pallavas. But the Bujang Valley had been mentioned in a Tamil poem, “Pattanopolai”, as far back as the Second or Third Century A.D. There, the Bujang Valley is called Kalagan, which philologists claim eventually gave rise to the modern-day Kedah. 3 May 2006 (The Star) – Merbok, Kedah preparing for development as a cultural heritage and eco-tourism centre. 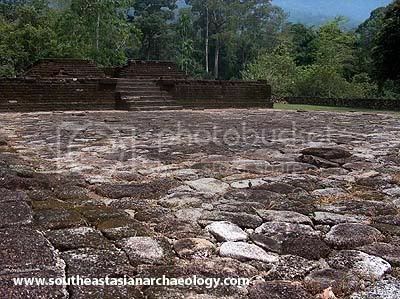 Bujang Valley containing ruins of Hindu and Buddhist temples in Merbok lends a historical importance. It used to be an important trading centre centuries ago.